William Smith was puzzled. As a young officer in the 1st Lanarkshire Rifle Volunteers he found no difficulty in controlling one hundred men placed under his command. Yet put in the same position on a Sunday with a group of lively Boys his attempts at discipline failed miserably. There had to be an answer. Smith found that answer with his Brigade of Boys. Introduce drill and discipline to the Boys, give them an interest and a purpose and they respond accordingly. That was the seed which was planted back in 1883 and which has grown to the massive youth organisation we know today. 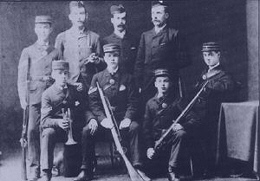 On Thursday 4th October 1883 the very first meeting of the "Boys' Brigade" took place in the North Woodside Mission Hall and a constitution was drawn up defining the object of the Brigade as "the advancement of Christ's Kingdom among Boys, and the promotion of habits of reverence, discipline, self-respect and all that tends towards a true Christian manliness". In these early days Smith enforced strict discipline on the Boys with phrases like "submit to the authority of officers" being commonplace. Yet Smith was successful in recruiting new members and took pride in the fact that many, despite working late, still turned up for Bible-Class. Those early Boys were not rag-a-muffins, scantily dressed in threadbare clothes as myth might have it. Most came from the expanding and comparatively affluent North-west of the city from homes of skilled men. Over the years this trend has continued not only for the City of Glasgow but all over the UK. In the first three days after the initiation of The Boys' Brigade 59 Boys came along to the Mission Hall - most out of curiosity. 35 of that number eventually agreed to the rules of the Brigade and formed the very first Company. There were no uniforms at the start, probably because of the expense, although every Boy wore a small red rosette at inspections which distinguished him as a Brigade member. The story of the 1st Glasgow Company's success led to other Companies being formed in Glasgow and soon expansion was rapidly under way. By October 1885 there were seven Companies of The Boys' Brigade with nineteen Officers and a total of 241 non-commissioned Officers and Boys. The youth movement had begun. Now in 1983, one hundred years after these hopeful beginnings, hundreds of thousands of Boys internationally can claim present and former membership of The Boys' Brigade. Every one of them is Sure & Stedfast in the belief of the future expansion of our movement.